Visitors to The Influence Project have no doubt seen the tiara wearing, turquoise phone-wielding, beatific smile bearing Mari Smith. But who is she and how did she emerge as one of the front-runners in this project? Her bio says she’s a “Social Media Speaker & Trainer, Chic Geek & Facebook Passionista!, author of @FacebookMktg and Spiritual Truth-Seeker.” We spoke last week and discussed her YouTube tutorial for The Influence Project, Twitter hijackers, and how she went about dispatching her influence campaign. Mark Borden: One week in, you’ve kept your place in the front row. What made you decide to participate in The Influence Project? Mari Smith: I was reached out to and given some early notification of the project, so that was one thing. But I love technology and when something is creative and looks different than anything I’ve seen before, I get excited. Besides the influence aspect, I was so excited to see all the pictures and be able to interact with them and move forward and back and up and down. It’s like a video game where you use your mouse as a joystick. It’s such a brilliant interface. Explain your process for sharing your involvement in the project. I instantly got it and totally understood it. You sign up, get your own unique link, and get people to click on it. I have an email database of about 15,000 names and I have a lot of loyal subscribers. I sent them a short html email explaining the project and used the line Your Picture in Fast Company magazine and illustrated it with a cover image from the magazine. I thought about people who are not as technically literate as I am and they’re probably going to go to the Influence Project site and think, ‘What do I do?’ So I said I think I’ll make a video tutorial. I got out my Screenflow and put together a video tutorial and put it up on Youtube. Then I went to SocialOomph–a place where you can manage your Twitter and preschedule direct messages–and I prescheduled 20 DMs to people I know who have large followings. People who I consider friends, Gary Vaynerchuk, Jason Falls, Erik Qualman, people I respect as social media experts who have large followings, and in my opinion, have influence. And I told them about the project. Now at no time in my email or DMs or Youtube tutorial did I say or qualify that when you click on my link, you are giving me credit. And I think that is where there was some pushback. How are you feeling about your progress? I’m excited about it. People tend to read my emails and I have 21,000 Facebook fans, so in combination with my tweets, Facebook and my database, I was able to collectively tap into all my different communities. What I really like about the project is the fact that anybody on the planet with an avatar can register and have their picture in Fast Company. What has been the best side-affect of the project? It’s led to discussions about influence on my fan page and my personal profile. We discuss what influence means and whether anyone can have it? It’s allowed me to ask, ‘What does it mean to you?’ I think a lot of people are enjoying my perspective and seeing this the way that I see it. This is a win-win, there is no lose here because it is so simple, click, get a picture, get a link, send it out and we’ll all see you in November. 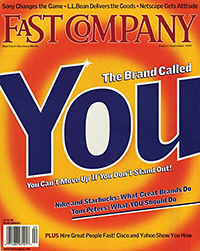 A big party in Fast Company. Why do you think people are so interested in social media right now? One of the reasons I think The Influence Project exploded is because you tapped into some basic human psychology. We like to think that we don’t have an ego, but there is an aspect of everybody that does want to see their name up in lights or have their 15 minutes of fame. Have you made any new contacts through the site? When I was tinkering around late on the site when you only had 7 rows, one avatar really jumped out at me, the name is Nate St. Pierre. He’s the one holding his hand up to the camera and on his hand is written change the world. It jumped out at me and I’ve never seen him before, never heard of him, only came across him because of The Influence Project. So I Googled him, found his Web site, signed up for his newsletter and he emailed me back right away. We started talking and said it would be great if we could work together. And I was like OK, bingo, this is why, among other reasons I think this project is brilliant. People can connect who otherwise never would have come across each other. The site is loose, but it is a network within a network, and a network of networks. I really like that and think it has tremendous potential for exponential collaboration. I think that’s phenomenal and I would love to see more people have that perspective. Not everyone feels that way. I work together with Michael Stelzner–the owner of socialmediaexaminer.com–a lot. I DM’d him early and he said he won’t be participating, that he agrees with Jason Falls. Then I looked at Jason Falls tweet stream because he hadn’t replied to my URL and there was Jason calling it a “whore project” and other things–he can be really tongue and cheek and I think he’s a wonderful guy, but he can be pretty vocal with his opinion. So I started tweeting him and he said, ‘I’m just questioning it.’ Then Amber Nusland blogged about it and I thought her post was thoughtful and I even posted a comment. It’s fascinating to suddenly get this strong reaction. It just makes me think we need to co-define words. Like where we’ve redefined authenticity and transparency–even though they’re being thrown around a lot and sometimes they lose their meaning. But look at how Facebook has redefined what friend means. Maybe it’s time to collectively redefine Influence. We’re all influencers and we are all influenced. Tell me about another interesting conversation you’ve had around this? I was talking to Robert Cialdini yesterday, (he and his office, I think about three of them, run his account on Twitter), and he of course wrote the book Influence. He said, ‘We’re not fooling our readers into participating.” Then I went to their site, and first thing I see is Help Us Become Fast Company‘s Most Influential Person. I was shocked by that. Of course, Robert is being very clear and above board and is a very respected man. But I hadn’t heard such things like people creating bribes just to get people to sign up. Are you still happy to be involved? I think it’s time for this work to be defined and clearly you’re getting some great buzz. Perhaps the project isn’t unfolding the way you first thought, but it’s quite fascinating and I can certainly see why people are choosing to create incentives, including charitable ones, and that’s fine, that’s their choice. What did you think when someone tried to influence you? My thought was, “Cool, you’re onto it too”. But there were a couple of things that didn’t sit right with me. One guy signed up and was saying @marismith, “I saw your smiling face on The Influence Project,” and then he put his own link on there. He’s someone I know and respect so I DM’d him and said I think you’re doing yourself a disservice the way that you’re tweeting this. I told him you don’t need to be throwing my name in there. He was trying to piggyback on your influence. That didn’t sit right with me. Another person retweeted something I cited from one of your blogs, something I didn’t put my link into because at this point I was holding back. And this lady retweeted me and it was not a correctly formatted RT and she put her own link in it making it look like I tweeted with her link. I DM’d her and said, ‘Was that a mistake? You’re in the same industry, you should know that’s not a properly formatted retweet and by putting your link in and making it look like I tweeted with your link isn’t right.’ She came back the next morning and said sorry it was a mistake. But I was perturbed by it and I asked her to delete it. One thing I can’t stand is people misrepresenting me. It’s one thing to attempt to use my influence, but if they are actually misrepresenting me and making it look like I’ve said something when I haven’t–they call that retweet hijacking where they take your link and stuff their link inside it. In the end she was very agreeable and deleted the tweet. I’m going to lay back, I feel I’ve already laid my foundation I’ve held my place on the front row all week. I’ve gotten some visibility and buzz and connection out of it. We’ll see. I’m taking it day by day, I do check the site a few times a day and I’m watching what people are saying. So far I don’t see any negativity about me, so that’s good. But in general I’m feeling the pulse of the project and just going with the flow. Read more about The Influence Project.